This is not your typical Manhattan! 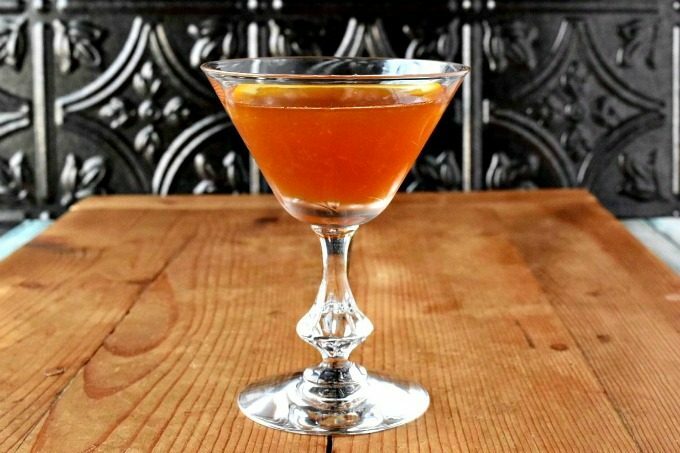 This Mincemeat Manhattan is filled with mincemeat flavor, a dash of chocolate bitters, and delicious orange flavor to round out this winter cocktail recipe. I don’t have many cocktail recipes on my blog. Wow. That’s a horrible first line for a post. But, it’s true because I’m not a mix-master by any stretch of the imagination. I wasn’t a very diverse drinking when I was younger. Heck, I’m still not a very diverse drinker. Most nights our cocktail of choice scotch on the rocks. Boring, I know. However, sometimes I get a wild hair and want to mix something up. I’ve done that a couple of times throughout my blog life. If you search for cocktail on my blog you get a few recipes. There’s eight to be exact. I have a decent range, but there’s definitely a Latin influence. Which is very interesting to me. I didn’t grow up drinking these drinks. For the most part, Dad drank bourbon and water. Mom drank gin and tonics. Sometimes we had hot toddies if we were sick. Then on Derby Day we had mint juleps. So as you can see, this is why I don’t have a very broad palette for mixed drinks. Therefore, I’ve been trying to branch out on my blog and create more mixed drinks and cocktails. Which brings me to this question. What is the difference between a mixed drink and a cocktail? Do you know? I cannot seem to tell or find the difference. After searching Google, I’ve came to this conclusion. A mixed drink is the physical process of making the drink, however, a cocktail is more intentional. 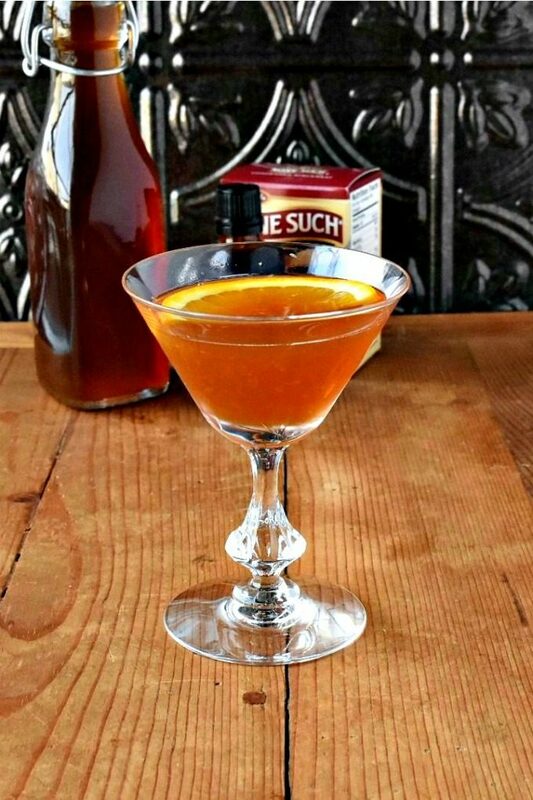 A mixed drink uses any bourbon, vermouth, and bitters to make a Manhattan. 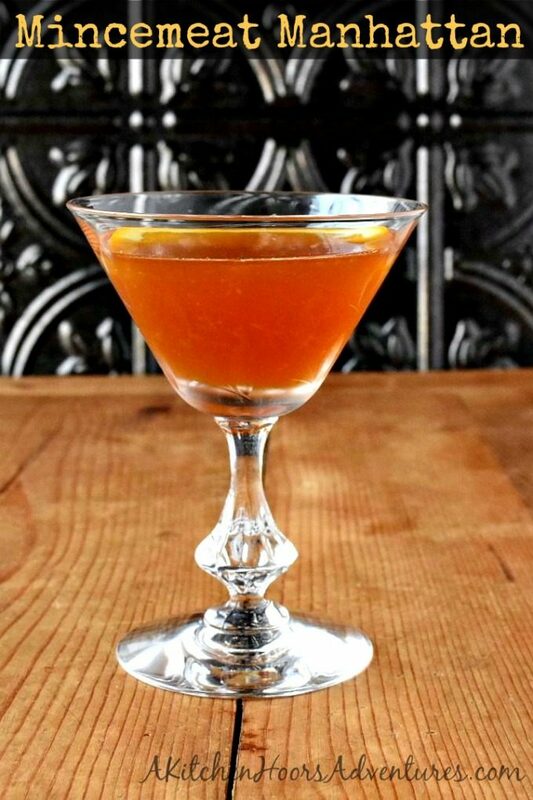 A cocktail uses mincemeat flavored vanilla bourbon and chocolate bitters. There’s no vermouth because the mincemeat bourbon is sweet enough on it’s own. Wait, you mean you missed the part where I infused vanilla bourbon with mincemeat? Yes, yes I did. And it tastes amazing. The bourbon long with a little orange muddled in the glass makes for an amazing cocktail. I went to about 7 different stores trying to find mincemeat. Surprisingly, I had no idea this early in the season that the stores would run out of mincemeat. Finally, I called my local Food Lion and they said, “Yes we carry that product.” Well, I thought so, but do you have any in stock? Carrying it and having it are two different things in my head. So, I walked into the store and headed to their baking kiosk. Not only did I find a jar of mincemeat, but something called mincemeat concentrate. I have never heard of this product. Mincemeat concentrate. Have you? I figured since I was infusing bourbon, the concentrate would be my best bet. And I was right! Of course, I’ll have to try this with regular mincemeat for comparison at some point. Honestly, can one have too much mincemeat infused vanilla bourbon in their bar? I don’t think so. Especially during the holidays. Just think of the different uses for this mincemeat bourbon! You can add it to eggnog or mulled cider. It would be food to douse a fruitcake with it. Finally, you can drink it in this Mincemeat Manhattan. Okay, I hear you Manhattan snobs. Yes. I know that sweet vermouth goes in here instead of orange juice. In fact, you’re not even supposed to put the orange in the drink. Get over it. This mincemeat vanilla bourbon is packed with flavor. The orange juice cuts all that mincemeat goodness slightly to balance the drink out. 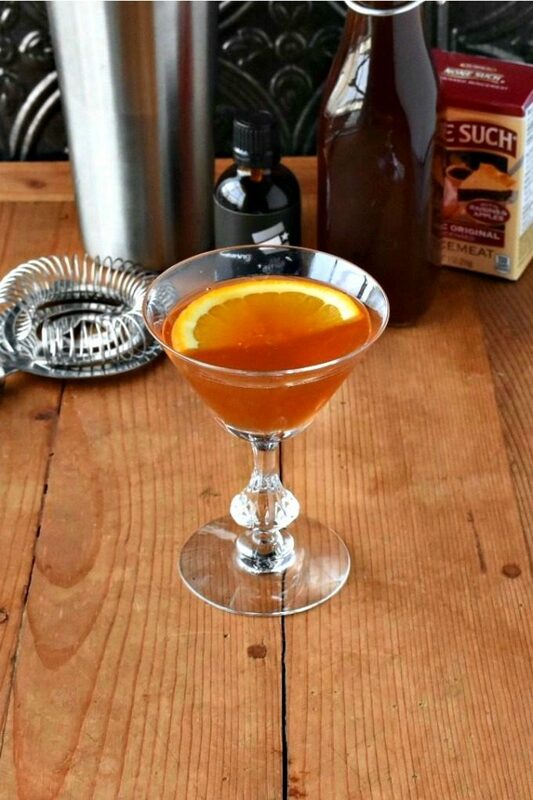 What’s your favorite winter cocktail recipe? Have you thought of infusing your own alcohol for your guests? Combine the vanilla bourbon and the mincemeat in a large jar and shake to combine. Shake twice a day for 3 days. Strain through cheesecloth and store in an airtight container. In a cocktail shaker filled with ice, combine the bourbon, orange juice, and bitters. Carefully stir the ingredients. 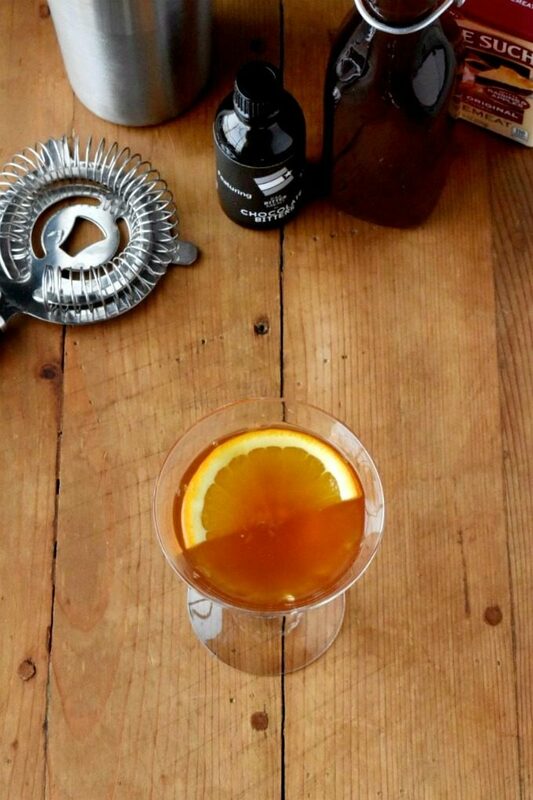 Run an orange peel around the rim of your glass. Strain the bourbon mixture into the glass. 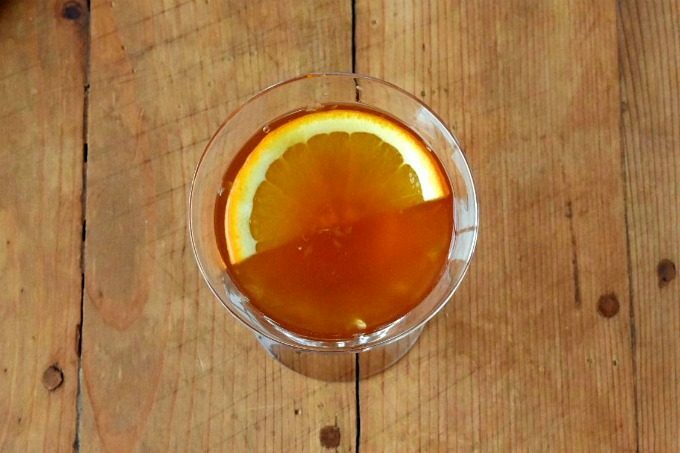 Garnish the drink with the orange slice. I have been enjoying a Manhattan as a nightcap lately. I am so intrigued by this recipe! We are going to the store today so I am going to look to see if I can find the Mincemeat Concentrate and pray I can find vanilla bourbon! Cannot wait to try this out! I hope you like it! I can’t wait to make it again this year. They’re so festive and different. What a creative cocktail! Can’t wait to find vanilla bourbon. It’s good! I could drink the vanilla Jim Beam on the rocks. It’s not too sweet either. Well Christie, for not being a mixologist you certainly created quite the cocktail. I’m impressed. I make my own mincemeat, so might have to try this with some leftovers this year! It’s such a creative idea! I hope you do! It turned out even better than I thought. I’ve not seen the mincemeat concentrate before. I’ll have to keep an eye out for it. I wonder how it would be in making ice cream? Oooooh now there’s an idea! I’d never seen it before either, but pounced on it when I did. I’ll be keeping an eye out for it again. My husband prefers a twist of orange to a cherry in his Manhattan. I bet he would love this version. I hope he does. It’s delicious. I was surprised at how well the bourbon tasted. I’ve never had mincemeat before but my brother lives Manhattan’s so we will have to give this a try. Mincemeat is apples and cinnamon and super delicious. We used to make mincemeat pies for Christmas sometimes. What an inventive cocktail! And that mincemeat bourbon would make great hostess gifts—along with this recipe! Of course it would! A super unique and tasty gift. This is such a creative cocktail! I normally drink bourbon, but I recently fell in love with scotch. What’s your favorite? We’re typically scotch drinkers here, too, but bourbon is in my blood. I love mincemeat but since my dad passed no one else does. This is the PERFECT way to get all I want! Sounds like it is perfect for you! I hope you enjoy it. I’ve never heard of mincemeat concentrate, Christie. Now I’ll be on the lookout. Your cocktail looks wonderful! I love the color and flavors. I was surprised to find it, Stacy. And snatched it off the shelf! Thank you for the compliments. That sounds amazing! A little prep-ahead, but not difficult. I really like how unique this drink is and will definitely give it a try! I hope you enjoy it! It’s very little prep, for sure. And such a delicious reason for that preparation. You have definitely stepped up your cocktail game. Wow! What a great mix of flavors!